How does Barack Obama lure wealthy donors to a big-money fundraiser in Hollywood? 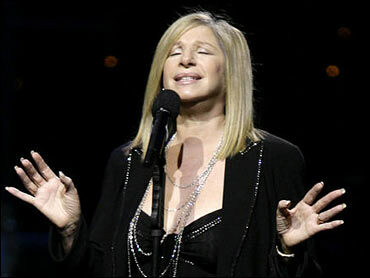 Bring in Barbra Streisand as the headline performer. The Oscar-winning singer and actress was to perform Tuesday night on Obama's behalf in Beverly Hills. It was to be a two-step evening with a reception and dinner costing $28,500 a person followed by a later event featuring Streisand at $2,500 a ticket. The wealthy fundraiser comes on a day when the crisis in the U.S. economy remained an urgent issue for many Americans. Monday's sharp sell-off left the Dow Jones industrials and the Standard & Poor's 500 index down by more 4 percent, eroding the value of individual retirement and investment accounts, for example. Streisand has been outspoken in criticizing John McCain's selection of Alaska Gov. Sarah Palin as his running mate on the Republican presidential ticket. "This calculated, cynical ploy to pull away a small percentage of Hillary's women voters from Barack Obama will not work," Streisand wrote on her Web page. "We are not that stupid!" "I believe John McCain chose Gov. Palin because he truly believes that women who supported Hillary - an experienced, brilliant, lifelong public servant - would vote for him because his vice president has two X chromosomes," Streisand said. "McCain's selection of Gov. Palin is a transparent and irresponsible decision all in the name of trying to win this election."